Kimberley and NT News: Opening dates for roads, parks and everything along the Gibb. I am glad that I pointed readers at my "What's New?" page in the last newsletter issue, with the recommendation to check it before leaving on a trip. The "What's New?" page is the place where I publish important information that reaches me between newsletters (plus other stuff). I had to publish one of those updates the day after my last newsletter. The newsletter had told you about the planned opening of the Kalumburu road that day or soon after. Well, guess what, it is still closed. Before we look at road and park opening dates, let's look at the weather. At the time of the last newsletter some weather models had predicted the re-formation of a weak monsoonal trough, with the usual embedded tropical lows which can develop into cyclones. The first tropical low developed north of Darwin, gave the Darwin region a good drenching, and then moved towards the Kimberley. After a few days the low did develop into a cyclone and was named Wallace. Wallace moved generally southwest but stayed away from the coast. Following the coast line (more or less) it brought some nice rain to the coastal regions, especially in the far north. Eventually it was downgraded to a low again and headed for the Pilbara, always keeping a safe distance from the coast. Two more tropical lows followed, they took a similar path but did not develop into cyclones. In summary, the coastal regions had some nice rains, and the interior had a little bit, too. But nothing dramatic happened, nothing that would have prevented an unusually early start into this year's season. If you are looking at an Easter trip to the Kimberley, you are in luck. Please don't take anything for granted though. We should not get any big tropical lows or cyclones anymore, but showers and storm cells are still passing through. They can dump a lot of water at once, and temporary track or park closures can happen any time. In addition, the new BOM climate outlook (from April 11) indicates a good chance of a wetter than average May, so even if you travel after Easter, be prepared for such closures. Early season travel is generally for people who are adventurous, flexible, can take enough time, and who are willing to take it as it comes and make the most of what they find. It should be a bit easier this year but the above still applies. Another thing worth mentioning is that the new climate outlook also continues to predict above average day and night temperatures. Currently you are looking at day time temperatures between 35 and 40 degrees dropping to between 20 and 25 at night. So, the Gibb River Road has been open all the way for a few weeks and grading is in progress. The Fairfield-Leopold Downs Road between Windjana Gorge and Tunnel Creek is also open now. But what about the Kalumburu Road? It had held up well over the wet season and was supposed to open when I last wrote. But then the road crews encountered afternoon showers bringing some heavy rain and causing wash outs. At the same time the tropical low which eventually turned into cyclone Wallace formed. There is no point in fixing and opening a road just before the next cyclone arrives, so the opening was postponed. Now, that the last cyclone and tropical lows have left the region, the graders are working on the road. The shire expects to be able to open the road before the Easter holidays start, but they can't guarantee it yet. Everybody at Kalumburu is ready for you. As soon as the Kalumburu Road opens, everything will be open. The King Edward River campground and the Mitchell River National Park should also open once the Kalumburu Road does. Please don't forget that Drysdale River Station is only open for diesel and unleaded. Accommodation, camping and meals will only be available from May 1. Windjana Gorge and Tunnel Creek will open on April 15, and Bell Gorge on April 17! Online booking for the campgrounds will be available from May 1, until then you need to pay with cash. Geikie Gorge is open (it didn't have to close this wet season), boat tours will commence May 1. And I totally forgot to include this in the last newsletter, but as usual, Purnululu did open on April 1. The Walardi campground is open, Kurrajong will open May 1. Online booking will also become available on May 1. The visitor centre is open 7 days a week. El Questro Station opened April 1. (Emma Gorge will only open on April 17). Ellenbrae opens April 15, as does Mt. Hart. Digger's Rest opens April 18. Next are Mornington (April 30) and Home Valley Station (May 1). Mt. Elizabeth Station currently plan to open their campground for the first weekend of May (4th/5th). They are doing extensive renovations and therefore don't expect to be able to open earlier. Mount Barnett have not announced an opening date for Manning Gorge yet but I expect they will very soon. I'll add it on my What's New? page when they do. I have not yet heard back from Charnley River. As with Manning Gorge, I'll have their info on the What's New? page as soon as I get it. Stations being open for visitors does not necessarily mean that all their attractions will be open or that all accommodation and meal offerings will be available! Please get in touch with the stations if you need detailed information about accommodation/meals or about which tracks, walks and gorges are open and which are still closed. Also keep in mind that the roadhouses are still on wet season opening hours, and that those hours will be reduced further over the Easter weekend. If you need anything from them, call them and make sure they are open for you. Last but not least: Ivanhoe Crossing in Kununurra opened for vehicle traffic on April 11! The early opening of Ivanhoe Crossing underlines once more just how poor the wet season has been. But what exactly does this mean for travellers? "We are making our way to the Kimberly's this year and it's disappointing to hear there has been no rain. My question is, is it still worth visiting without the rain to fill the gorges etc?" Over the last month I have received countless mails from worried people. Will the gorges just be muddy holes? Will there be water restrictions? Is it even worth going? People, relax, a poor wet season does not turn this paradise into a desert. Far from it. There seems to be the idea floating around that it didn't rain at all and that everything is bone dry. It rained everywhere, we just had none of the big monsoonal downpours and floods. Big gorges don't need filling and big rivers don't disappear. In the appendix of Destination Kimberley you have a bunch of links to helpful pages on the BOM website. One of those pages is this one. It's a rainfall map and you can select the time period to display. Let's select "6 months" from the drop down menu and check how much rain the Kimberley and Top End got. As you can see, most parts of the Kimberley got between 400 and 600mm, some up to 800 mm. That's not nothing, and most of it fell in the second half of the season. The Kimberley is lush and green and most creeks and falls are flowing. The difference to a good wet season is that the falls are flowing, not roaring. And they will stop flowing earlier this year. When? That depends on the falls and their catchment area. Even in a good year some waterfalls only flow right after the wet season (some even only for a few days after a good rain!) and reduce to a trickle very early. This year it will be even earlier. But many of the pools are always there. The river and creek crossings are not as deep which makes access easier. But beware, creeks can come up very quickly after rain, and it will still be raining here and there for a while. Overall, everything will simply happen earlier. Falls stop flowing, water crossings drop, smaller waterholes shrink and disappear, campgrounds become dry and dusty, and the country changes from all green to more and more red, gold and brown. People also still find plenty of places to swim, because big gorges don't dry out. I myself first came to the Kimberley in 1994 in late September/early October. It was by far the most beautiful and spectacular place I had ever seen. So beautiful that I could not tear myself away from it, so I stayed. Catching everything at its very best is always a gamble. I'd even say it's impossible. Some places dry up early when other places in lower lying areas are not even accessible yet. Some years the people who travel before June miss out because some roads and well known places are STILL closed. People who travel after June have to deal with huge hordes of other tourist. For some people the heat, humidity and the insects are more of a worry than disappearing waterfalls. Sure, it's nice if the wet season was exceptional and the country is still all green and all the waterfalls flowing rather than trickling in July, when the temperatures have dropped. But have a browse through the reader letters in the newsletters from last season, which was such an exceptional season. Ultimately, by far the biggest factor for the enjoyment of a trip seems to be the number of other travellers, not the amount of rain during the previous wet season. The Kimberley is always worth a visit and all visitors should consider themselves lucky to be able to see this spectacular part of the world, at any time of the year. Don't worry about how much it rained last wet season. Spend your time figuring out how you're gonna get away from the other tourists! 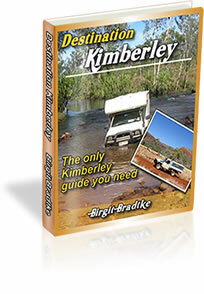 I wrote Destination Kimberley to help you do just that. And that's it already for today. I haven't received any questions about it in the last weeks. Everybody is just concerned about the bone dry (not!) Kimberley. And there isn't much to say other than that everything is still very much in wet season mode. If you are in the Top End for Easter, check the appendix of Destination Top End. There you find the links to all the park information and road reports. The reports for Kakadu and all other NT national parks are excellent, very detailed. It's much easier to get this info for the NT than it is for the Kimberley! I want to wish you a Happy Easter, and if you happen to spend it in the Kimberley or NT, I wish you a great trip! Send us your trip reports, photos or videos, or just a short message with your impressions when you are back. Happy Easter and happy planning!